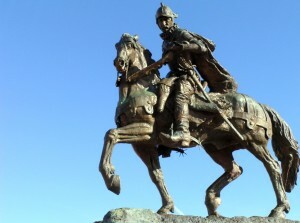 A conquistador, Oñate established the Spanish colony of New Mexico in 1598 and served as its royal governor. He was a despot, obsessed (as many early Spanish explorers and settlers were) with finding the legendary Seven Cities of Gold in the New World. His explorations failed to find gold, but did chart vast regions of the American Southwest. Oñate’s harsh treatment of Indians and Spanish settlers alike resulted in his expulsion from his own colony. His sentence was subsequently reversed, but he was never restored to the office of governor.